Keith Yandle and Martin St. Louis celebrate Marty’s goal in the third period en route to the team’s third straight victory. Photo courtesy of Getty Images. Ladies and gentlemen, introducing the first place New York Rangers. 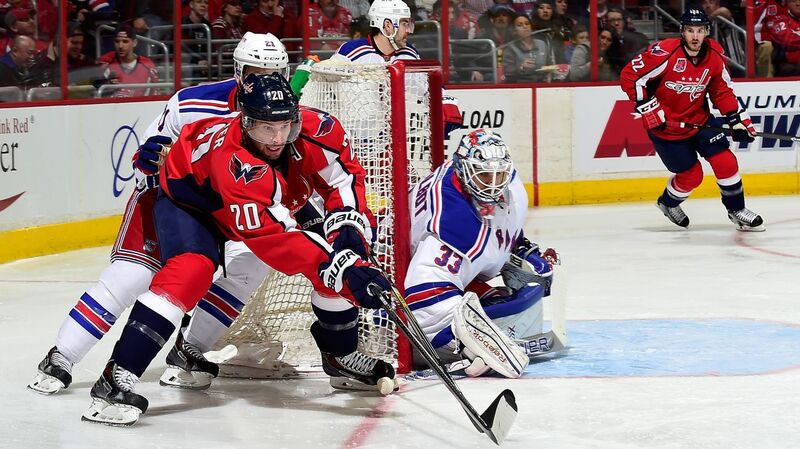 Playing their second game in as many nights, the Rangers (42-17-7) picked up yet another crucial win, defeating Washington Capitals (36-22-10) by a score of 3-1, earning their third consecutive win in the process. With the Islanders idle tonight, the two points that the Blueshirts earned gives them a total of 91 for the season. That means that for the first time, the Rangers have sole possession of first place in the Metropolitan Division, sitting one point ahead of the Islanders with three games in hand. Not only are they first in the Metro, the Rangers are now tied in points with the Canadiens, but since they have played less games, technically hold the first spot in the Eastern Conference. But it does not stop there. With the Anaheim Ducks losing 6-3 to the Calgary Flames, your New York Rangers are now first in the NHL standings. Top of the entire league. The Ducks, Canadiens and Predators also have 91 points, but the Rangers have games in hand on both teams, which gives them the edge in the standings. All of this thanks to a 31-7-3 record since December 8th, and a 13-2-3 since Henrik Lundqvist wen’t down with the blood vessel injury. It’s been a tremendous run for the Rangers, and the Rangers may just now be coming into form. And when Lundqvist comes back, the team will be even better. The Rangers saw a playoff atmosphere for the second consecutive night, and the game had that aggressive and physical edge to it. Both teams had something to prove, and the stage was set for a great rivalry matchup. Carl Hagelin got the Rangers on the board early, scoring his 15th goal of the season. Photo courtesy of Getty Images. The Rangers would break through first on a gorgeous play off of a rush. Hagelin started the play with a shot on goal, and Holtby left a big rebound. JT Miller made a great pass over to Boyle for another shot, and that rebound was collected by Hayes. His shot was stopped, and Carl Hagelin was at the doorstep to sweep in the loose puck, scoring his 15th goal of the season. The Capitals would battle back and score one of their own, and it was the league’s leading goal scorer, Alex Ovechkin, scoring his 45th goal of the season to tie the game at one. His one-timer was deflected off of Jesper Fast’s stick and changed directions, catching Talbot off guard and finding the back of the net. It was Ovechkin’s 21st power play goal of the season. Some hard work and a missed power play opportunity later, the Rangers took the lead on a crazy bounce off of the boards. Washington tried to clear the puck, but it hit a stanchion, falling right at the feet of Kevin Hayes. He passed it off to JT Miller, and he sniped one short side past Holtby for his 7th goal of the season, and the Rangers had the 2-1 lead. JT Miller is congratulated by teammates for his 7th goal of the season, one that would turn out to be the game winner. Photo courtesy of Getty Images. Early in the second period, Cam Talbot made an incredible save on a Capitals 5-on-3 power play. Nicklas Backstrom was alone on the side of the net. Somehow, Talbot got over to the other side of the net, stretching out his glove hand and catching Backstrom’s wrist shot. It was a turning point of the game, and may have saved the game for the Rangers. The Capitals would continue to pressure, and Talbot was there to fend off their advances. The Rangers parked the bus in the third period, staying back and playing a disciplined, intelligent game. What helped was that they didn’t fall for the Capitals antics, and let them shoot themselves in the foot. Alain Vigneault did a fantastic job of getting Ryan McDonagh and Dan Girardi on the ice whenever Ovechkin was out there. The frustration was seen on Ovechkin’s face throughout the night, and while he did have four shots on goal, he also had six missed shots. 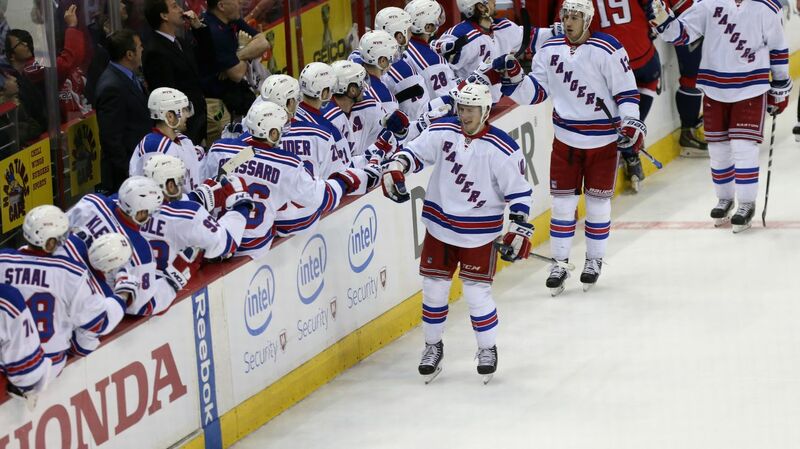 After playing some great defense, the Rangers were rewarded with another goal. Chris Kreider made an absolutely fantastic read on John Carlson’s pass, and used his speed to rush up the ice. He backhanded a pass over to Martin St. Louis, and he shot it past Holtby for his 19th goal of the season, snapping a six game scoreless streak. That would be the final score, and the Rangers left the Verizon Center with a 3-1 win. St. Louis cashed in on a great play by Chris Kreider, snapping a six game scoreless streak with his 19th goal of the season. Photo courtesy of Getty Images. 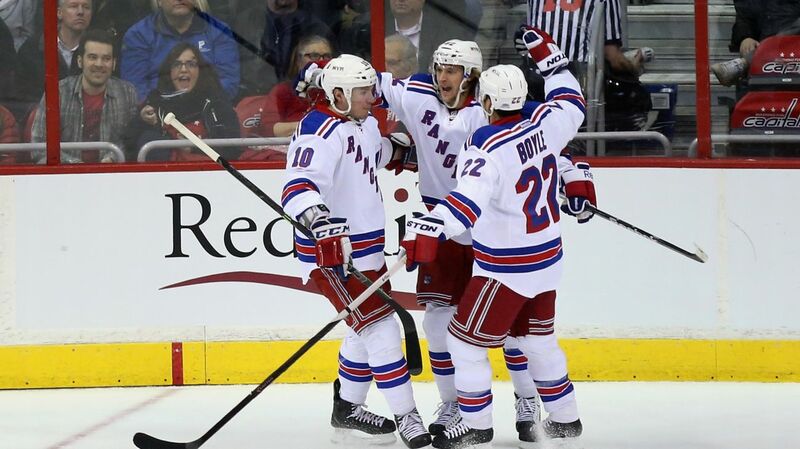 It was another complete game for the Rangers, playing well offensively, defensively, and in the neutral zone. Everyone contributed, and helped give New York their third straight victory. Cam Talbot was superb again, allowing just one goal on 29 shots. Talbot is 7-1-1 with a 1.54 GAA, a .948 save percentage, and two shutouts in his last nine starts. He’s 4-0-1 with a .99 GAA, a .966 save percentage, and one shutout in his last five starts. Talbot is also the first Rangers goalie EVER to allow one goal or fewer in regulation in four consecutive team games, all on the road. Talbot has gone above and beyond the call of duty by assuming the starter’s role, and he has been outstanding in this last stretch of games. He’s totally focused, and totally capable of carrying this team as far as they need to go. Cam Talbot was phenomenal in net again, stopping 28 saves for his 16th win of the season. Photo courtesy of Getty Images. The third line was outstanding, and provided that offensive spark that the Rangers really needed. JT Miller’s goal was gorgeous, and the passing on Hagelin’s goal was impressive. This line continues to play well, and with the constantly improving Kevin Hayes at center, have become a dangerous line. Dan Boyle had another really solid game. He was always in position for an offensive opportunity, and started the rush on the first goal. The acquisition of Yandle has made Boyle much more comfortable, and he is thriving with the new defensive formations.His best play came in the third period, hurrying to deny Alex Ovechkin by blocking a rebound opportunity. If there is one bad thing I need to point out, it’s the power play. The Rangers were 0-3 on the man advantage, and are just 1-17 in their last six games. The acquisition of Keith Yandle was supposed to help the power play, but it has been pretty awful lately. Kevin Klein took a wrist shot to the forearm late in the game and was in a lot of discomfort. He will get X-Rays and more information will be released potentially tomorrow. The Rangers have two days off, and will take on the Buffalo Sabres on Saturday at the First Niagara Center. Talbot may get a rest that night, so Mackenzie Skapski could make his second career start. 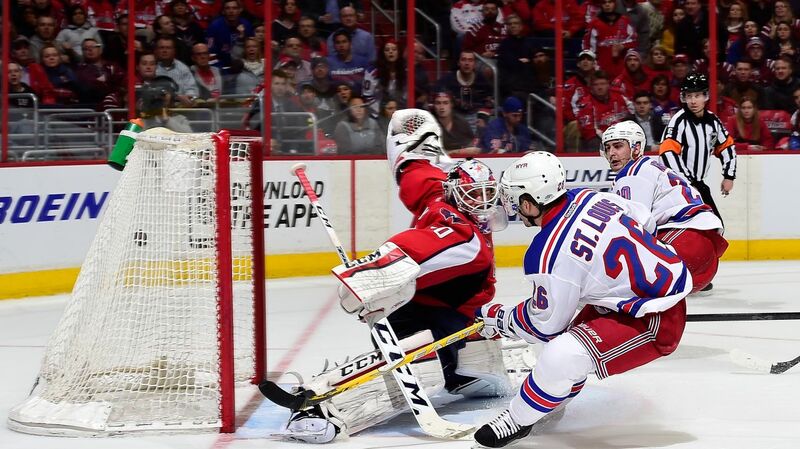 Posted on March 12, 2015, in Game Recaps and tagged Alain Vigneault, Alex Ovechkin, Cam Talbot, Carl Hagelin, Chris Kreider, Dan Boyle, Dan Girardi, Derek Stepan, Derick Brassard, Dominic Moore, Henrik Lundqvist, James Sheppard, Jesper Fast, JT Miller, Keith Yandle, Kevin Hayes, Kevin Klein, King Henrik, Mackenzie Skapski, Madison Square Garden, Marc Staal, Martin St. Louis, Mats Zuccarello, Matt Hunwick, MSG, MSL, New York, New York Classic, New York Rangers, NHL, NHL 2014-2015 Season, Nicklas Backstrom, NY Rangers, NYR, Rangers, Rangers Nation, Rangerstown, Rick Nash, Ryan McDonagh, Tanner Glass, The Ranger Zone, Washington Capitals, Zuccarello. Bookmark the permalink. Leave a comment.